ROCK HILL, S.C., June 19, 2018 — (PRNewswire) — 3D Systems (NYSE: DDD) announced that Sauber Motorsport AG, the company operating the Alfa Romeo Sauber F1® Team, has added five new ProX® 800 SLA 3D Printers to its headquarters and engineering facilities in Hinwil, Switzerland, within the scope of a new partnership agreement between 3D Systems and the Alfa Romeo Sauber F1® Team. Sauber Motorsport AG first started using 3D Systems' solutions more than ten years ago when it built its Additive Manufacturing department. The new SLA (stereolithography) systems join existing 3D Systems products used by the F1 team, including six SLS 3D printers. "When we decided to upgrade our SLA production capability, we felt it was time to take our cooperation with 3D Systems to a deeper level. We also needed to expand our capacity so replacing some of the older 3D Systems SLA's with the higher throughput ProX 800 was the natural choice," says Christoph Hansen, head of additive manufacturing, at Sauber. "We are using 3D Systems' SLA solutions predominantly and extensively for wind tunnel testing, but also for tooling for carbon laminating as well as vacuum casting for silicon parts." Wind tunnel testing is essential for the aerodynamic development of a Formula 1 race car. A 60 percent scale model of the car is produced for testing in Sauber's own state of the art wind tunnel located at its headquarters in Hinwil. 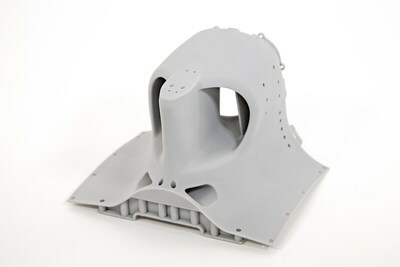 This model is produced mostly with additive manufacturing - 3D Systems' SLS and SLA 3D printers are used for everything from front wings, brake ducts and suspension covers to engine covers, internal ducts and hand deflectors. "We can't really compare this process to conventional manufacturing because it would be impossible to do it any other way than 3D printing; we require many parts with superior surface quality in a very short time," says Reto Trachsel, head of aero design, at Sauber. "There have been times when the wind tunnel, which is also used by our third party customers, has been running 24/7 and we have been leveraging our 3D Systems' solutions to produce 200 to 300 plastic parts per work day." Once the development is approved, the final parts are produced, often in carbon fiber using both conventionally manufactured and 3D printed molding. 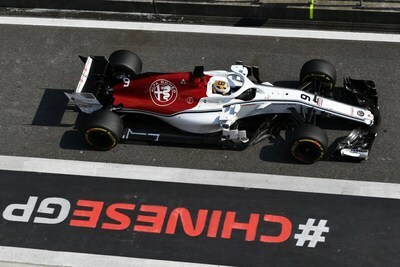 "The Alfa Romeo Sauber F1® Team draws on a variety of 3D Systems' SLA materials to produce tools for different applications. For example, we laminate carbon parts using tools produced in Bluestone material and we use the Xtreme material for vacuum casting tools to produce the sealings," says Hansen. "Why do we 3D print the tools instead of using conventional tooling techniques? The answer is easy – we get the design complexity for free! This is absolutely essential for parts like complex duct systems." "It takes a winning team to succeed in Formula One® and the 3D Systems partnership with the Alfa Romeo Sauber F1® Team matches the world's most advanced additive manufacturing solutions with cutting edge automotive engineering. By increasing production throughput with the addition of the 3D Systems' ProX 800 SLA systems, Sauber can test more design revisions and push the limits of race car innovation," says Phil Schultz, senior vice president, general manager, on demand solutions and plastics, 3D Systems. "Formula One® is the ultimate proving ground for 3D printing and the expertise we continue to acquire can be applied to mainstream passenger vehicles as well as aerospace and other industries." In addition to using 3D Systems' Additive Manufacturing for its own prototyping and production requirements, Sauber also leverages the 3D printers for its Engineering services. This enables companies all over Europe to benefit from Sauber's expertise, 3D printed precision mock-ups, jigs and fixtures, tooling and serial production. "Sauber Engineering is bringing race track performance to all kinds of companies, large and small. Whether we're optimizing the performance of our own F1 cars or helping our 3rd party customers re-imagine opportunities from prototyping to serial production, we're relying on our expanding arsenal of 3D Systems' additive manufacturing solutions to give us a competitive edge," concludes Hansen.